For many workplaces, email is the bane of the people that work there. In an effort to bring sanity and calm to the world of the inbox, our friends over at SaneBox have created a revolutionary approach to managing email. They believe email can be a powerful tool, rather than a necessary burden, and that used well, email can be an incredibly powerful way to communicate. We wondered what inspired them to think this way, so we spoke with Dimitri Leonov, the SaneBox COO, and Nicholas Wentz, the Head of Marketing to get their ideas on what really matters in business. Their answers are below, lightly edited for clarity. When it comes to running a successful business, what’s the biggest time-waster for a small business owner? The biggest problem for any startup or small business is that there are always dozens of things that need doing, but you only have the mental capacity to think about a few each day and the focus and energy to work on one. The biggest time waste is choosing to focus on the wrong thing(s), so prioritizing the one thing that will move your business forward is essential. Simple — managing stress and creating a time to think when you don’t feel overwhelmed. Feeling overly anxious and overwhelmed doesn’t increase productivity at all, it actually slows us down. It’s vital to create some quiet space and time every day, for example, 15 minutes of meditation or taking a walk. The right software depends on the specific business you’re running. Great software should help you be more productive and smooth the way you interact with people. For example, if you’re selling directly, you need a CRM. If you’re scheduling meetings with clients, you need a scheduling service like Calendly. Of course, everyone needs email, for which we humbly suggest SaneBox! How can business owners make use of the “Pareto Principle” – 20% of their effort drives 80% of their results? Use it in absolutely everything. If you have ten things to do, figure out which two will be the most impactful and beneficial, only do them. Journal — keep notes of how the day went, what went well, what didn’t, how you felt, failures, and successes. Meditate — take some quiet time each morning and evening to be mindful and recharge. Exercise — get out of the office and do some gentle exercise for 30 – 45 minutes a day. How does clear and consistent communication (especially written communication) translate into better results? It’s absolutely vital to have clear and consistent communication. We have a daily stand-up meeting every morning to check in with one another (most of the team is remote) and provide relevant updates. It’s also an internal policy to log everything in Asana (our project management and collaboration tool). If it’s not in Asana it doesn’t get worked on. What are your secrets to collaborating better with team members, colleagues, suppliers, partners, and customers? We use two systems for internal communication, Slack (for quick conversations) and Asana (for managing projects). When it comes to collaborating with partners and customers, it’s all about email! What tools can we use to evaluate, understand, and improve how we work? Keep it simple, have regular check ins with the team and ask how everything is going. Encourage them to be honest and act on the feedback. Create trust. No hurry, no pause — Tim Ferriss. What do you love about your job and what inspired you? We love being able to make a big impact every day and empower others to do their job better! What’s the most difficult task you have to do at work on a regular basis? Managing priorities. Every month (or more often if necessary) our team has a meeting to ensure we’re focused on the right things. Sometimes, recalibrating and adjusting priorities is critical to meeting our growth goals, while at other times this meeting acts as a reassuring sanity check. We hope you’ve enjoyed reading these insights. 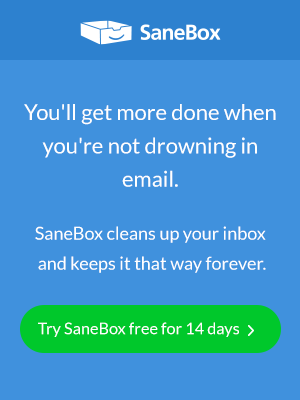 If you want to start managing your email better, sign up for a free trial of SaneBox.